The properties of metal and plastic surfaces are essential quality characteristics in process chains. Optimal process quality requires testing the wettability of surfaces after cleaning or pre-treatment processes as well as before subsequent processes. 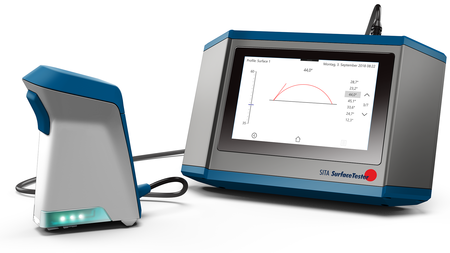 At the parts2clean show SITA Messtechnik GmbH presents the SITA SurfaceTester, a new hand-held measuring device for controlling the wettability by contact angle measurement. The device is suitable for mobile use without PC and easy to use via touchscreen. This enables a fast evaluation of the surface wettability directly at the process of parts manufacturing. The handy sensor head and the small contact area support measuring at parts with various geometries. The SITA SurfaceTester completes the SITA product solutions „Concentration Measurement – Cleanliness Inspection – Contamination Monitoring“ by “Wetting control” for quality assurance and economic efficiency in process control. Numerous application examples in manufacturing processes demonstrate the profits of the easy-to-use measuring devices for monitoring and controlling the concentration of surfactants, cleaner and contamination in aqueous cleaning media as well for controlling the cleanliness and wettability of part surfaces. The presentation of our application specialist Tilo Zachmann at the innovation forum of the parts2clean on 24 October 2018 shows application examples and advantages of the innovative measuring device. Visit SITA Messtechnik GmbH at the parts2clean in Stuttgart/Germany from 23 – 25 October 2018. You find us in hall 3, stand B21. Our application engineers will provide information about the beneficial use of our measuring devices for quality assurance and process control of parts cleanliness.